I like any pasta al dente, meaning a little firmer. This usually means cooking the pasta for a minute less than the recommended cooking time. Bring 4 cups of water to a boil, add a teaspoon of salt, and the orzo. Boil the orzo for 8 minutes, then strain from water, and rinse the orzo with cold water. 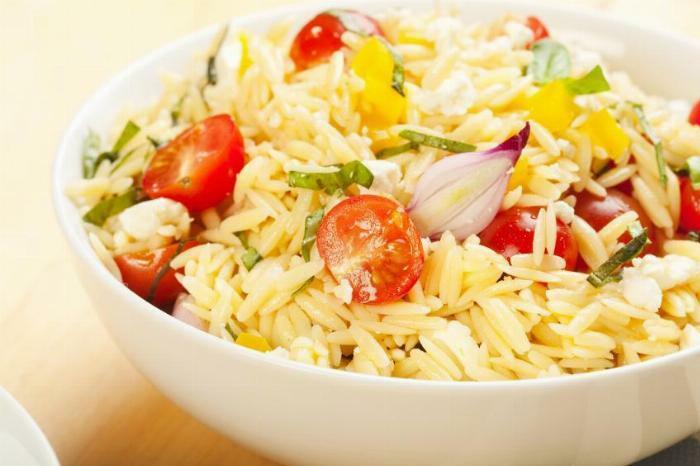 In a large mixing or serving bowl, add the orzo and 2 tablespoons of oil. Mix to coat the orzo . . .
1I like any pasta al dente, meaning a little firmer. This usually means cooking the pasta for a minute less than the recommended cooking time. Bring 4 cups of water to a boil, add a teaspoon of salt, and the orzo. Boil the orzo for 8 minutes, then strain from water, and rinse the orzo with cold water. 2In a large mixing or serving bowl, add the orzo and 2 tablespoons of oil. Mix to coat the orzo with olive oil. This prevents the pasta from drying out or getting sticky. 3Cook your shrimp in your desired style. If it's summer and a grill is available, definitely grill the shrimp. Otherwise sautee your shrimp in butter. The cooking time of your shrimp will vary depending on the size of your shrimp, but in most cases will take around 6 minutes to cook (grill or sauteed). Add the shrimp to your bowl of orzo. 4To make the vinaigrette, in a separate bowl, whisk together all vinaigrette ingredients. 5Add the remaining vegetables and cheese to the bowl and mix into the pasta and shrimp. Then mix the vinaigrette into the pasta salad. This pasta salad can be made a day in advance before serving.